I really can't think of a time that I wasn't creating something with my hands! As a kid, I used to make macrame plant holders, stitch clothes for my troll dolls out of Kleenex, and embroider owl pillows for my bed. One year, all of my friends got Barbies for Christmas, and I got a candle making kit. I was thrilled! My daughter first told me about Etsy, and then a good friend of mine opened a shop and encouraged me to do the same. I have mostly created work for personal use, gift giving, and community organizations. I loved helping with school play costumes, Brownie activities, and after-school art programs. Before our Calligrapher's Guild became inactive, I spent many years chairing several different committees and holding office. 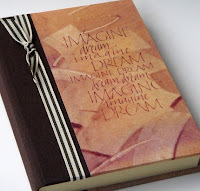 My shop currently offers a variety of handbound, hardcover, blank journals with batik fabric or bookcloth covers. At present, I'm also offering a selection of hand-lettered ACEO's. All of the work that you see in my shop has been handcrafted by myself, although my family and friends help me tremendously by donating their feedback and encouragement! I really feel like I'm still a newbie, but what I've learned so far is that you should do what you love. If your heart's not in your work, it will show in your final product. There are so many wonderful things that I want to create...I have an awfully hard time prioritizing! "Measure once, cut twice...or is it the other way around?!" I have been a lettering artist for many years, and while taking a workshop, we made a simple book to showcase our letterforms. I was hooked immediately! I think that I've been crafting from the time I was allowed to use safety scissors. The bookmaking bug bit me about four years ago. I love to do longstitch variations. 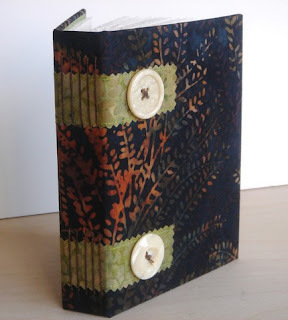 Currently, I'm loving the combination of fabric and buttons for the covers, creamy Italian Velata paper for the pages, and a fun color of waxed linen thread to sew it all together! Basically everything! But, I think that I'm most inspired by artists willing to share their artwork and their process with others. That's one of the many things that I so appreciate about BEST! My mom was my first "craft buddy", and she has encouraged and nurtured my creative spirit every step of the way! Lori is very talented with a great shop. Her gracious spirit comes out in her blog. It's great to see her featured here. 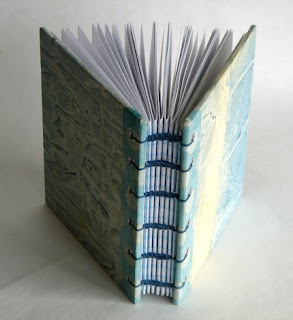 Lori is one of the most talented and creative artists in the bookbinding genre because she has something that most artists don't have---20 years experience in letter design and the art of calligraphy. I know this because she is my best art buddy and she inspires and encourages me most every day. I love her books and her Etsy shop is wonderful.